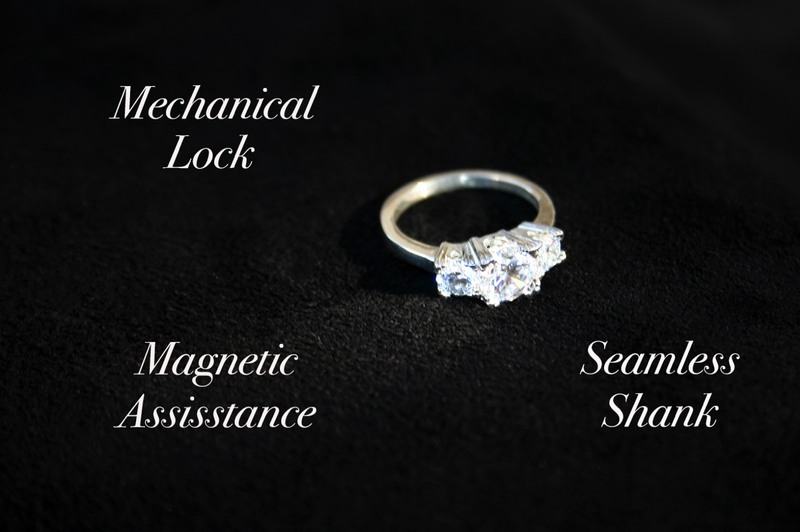 We have created 3 fantastic rings that have been designed specifially to work with The Missing Link! Each ring will make your handling of The Missing Link extremely easy to manipulate so you can concentrate on the presentation. Each ring is marked so you always know where the gate opens. Both the Gold and Silver Mens versions are fantastic. The great Billy McComb once showed me his collection of Himber style rings. He carried 12 rings to every show. He wanted to match the rings as close as possible. Personally I believe that if you have all three of our rings you are totally covered. 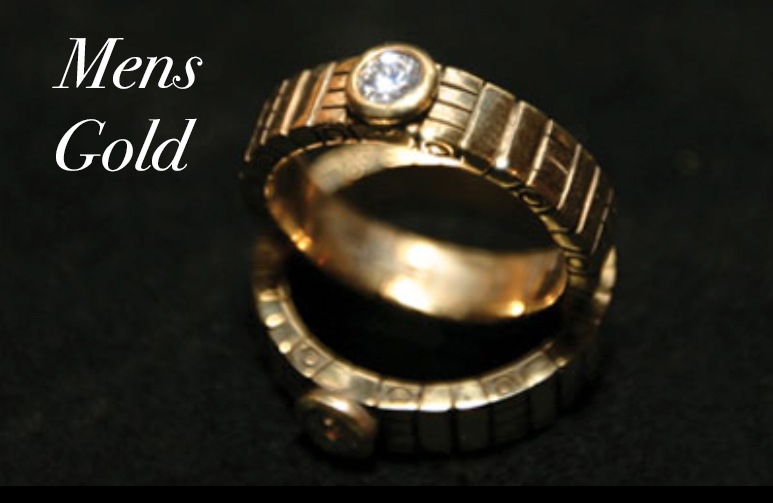 The Gold Mens covers all Gold wedding band style rings. 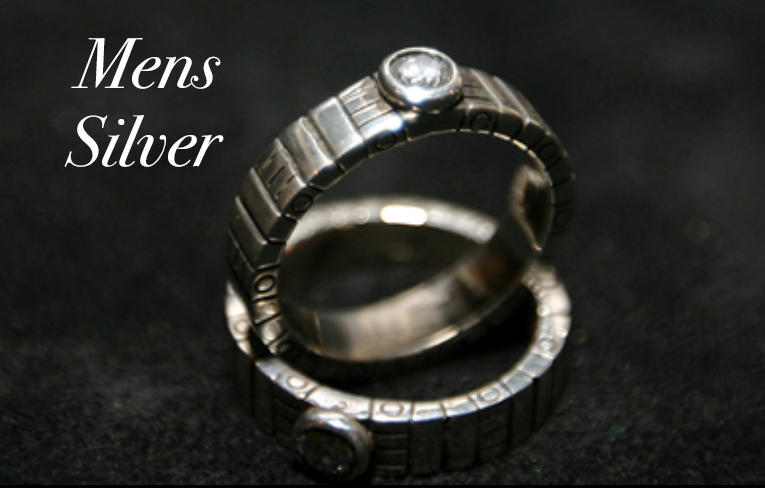 Our Silver Mens covers Platinum, White Gold and Silver. Obviously the Ladies Ring covers and diamond style ladies ring. 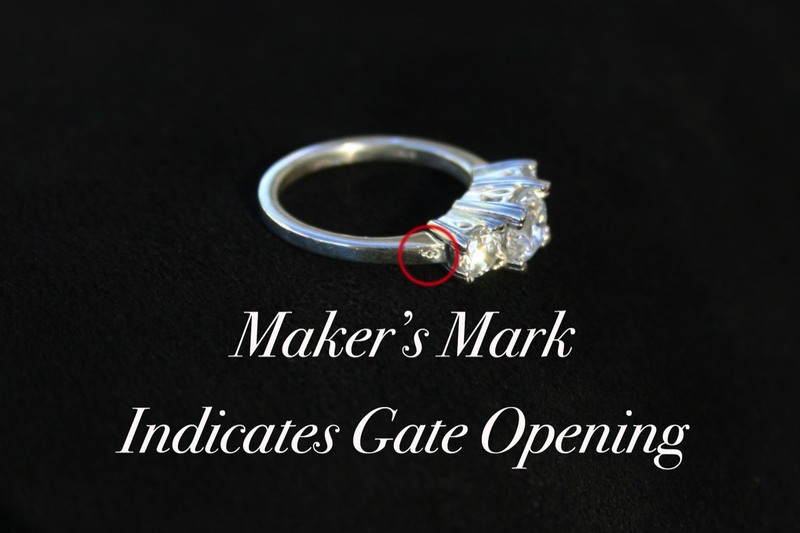 Bob Kohler and Scott Alexander have been working together developing the ultimate stage version of the classic Linking Finger Rings for decades. This quest has finally reached our stringent goals. Linking Finger Ring routines in the past have suffered from many weaknesses. Virtually all of the routines happen in the audience, not on the stage. The inferior handling and choreographies usually reduce one of the most powerful effects to puzzle status. A new benchmark is now available, The Missing Link. Scott and Bob have solved each and every weakness and the end result is the most powerful, visual and hilarious version ever witnessed by audiences. The most damaging weakness in Linking Finger Ring routines is performers have taken what should be a stage routine and performed it in the audience off the stage. This flaw makes the routine play "small". The majority of the audience cannot see most of the routine. The Missing Link finally solves this issue. All of the visual links, unlinks and proofs happen on stage in front of the owners of the rings! The payoff is incredible. The everyone in the audience can see each and every part of the routine. They witness the owner's reactions to the links and unlinks. They hear the owner's admission that their ring is linked proving the impossible has happened. The owners faces tell the story. The audience can follow the plot chapter by chapter as it unfolds delivering a reaction that is simply a show stopper. Scott developed a brand new, cutting edge method of visually linking the rings. Gasps are the norm. Even in showrooms of 1000 the audiences can see just how amazing the linking of the finger rings is. Scott's solution is brilliant and easily the best solution...period. Here's the sequence. It's fast and stunning, it takes about 4 seconds to perform. The audience sees a single ring on a pencil, it visually links to the second ring so two rings are linked. Immediately the chain of two is linked to the third ring producing a chain of three. You won't believe your eyes. It's very easy to do because of two things, Scott's brilliant concept and the design of the Missing Link Ring. Scott and I spent over 18 months finalizing the choreography and handling that make The Missing Link extremely easy to do. Over 100 live shows on cruise ships in front of 1000 people in the audience were our testing ground. The Missing Link is not a pipe dream but a tested, proven method integrated into a commercial routine. The design of the Missing Link Ring eliminates the problems of the past. The performer always has complete control over the rings. Guesswork has been eliminated. There is absolutely no fumbling or what we call the Itsy Bitsy Spider moves usually seen in Linking Finger Ring routines. Each and every part of The Missing Link is smooth and direct. No fumbling, no wasted motion, just instantaneous success! 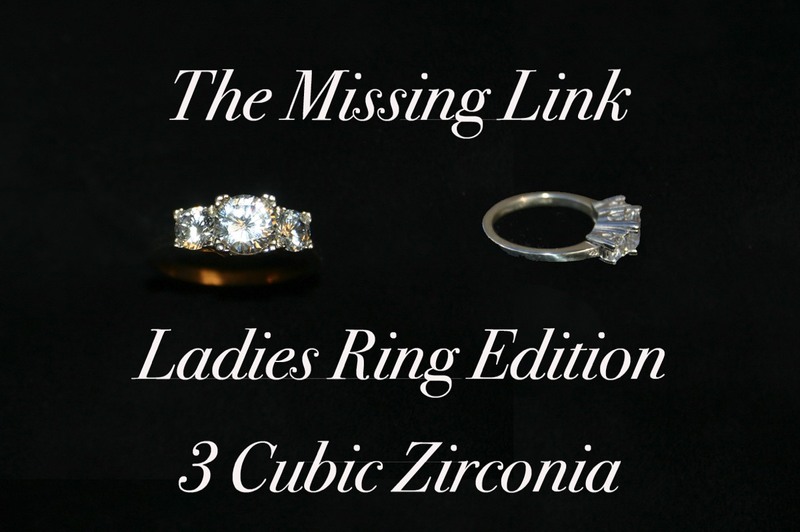 There has never been a Linking Finger Ring routine that is as funny or entertaining as The Missing Link. The jokes are rock solid and audience tested. The interaction with the spectators on stage is for the first time visible to everyone. The Missing Link is commercial and the perfect routine for any age audience. From corporate to family shows, the comedy is really funny but never offensive. The Missing Link Ring is handmade jewelry crafted by an artisan we searched for and finally persuaded to take on our manufacturing. The metals are pure, no pot metals, brass or any alloys are used. The Silver Missing Ling Ring is a 100% pure silver wedding band with a man-made diamond. The Gold Missing Link Ring is exactly the same but with a thick coating of Gold. Both Missing Link Rings are designed to look like high end jewelry so you can work any crowd even the filthy rich without suspicion. The Silver version looks like 3 types of very popular rings, Platinum, White Gold and Silver. Obviously the Gold version is high quality yellow gold. The pictures tell the story, what you see is what you get. The Missing Link video training is delivered by instant download when you place your order. You will have the training instantly so you can start the learning process while you wait for your Missing Link Ring to arrive. The video is delivered in HD 720P. The training is 1 hour and 26 minutes in length. There are three full performances shot live on cruise ships. The Inner Secrets of The Missing Link are covered in the incredible detail you've come to expect from Bob Kohler Magic. The Missing Link is designed for professional performers. It is our intention to protect your investment in The Missing Link. All purchasers should be aware that their identity is permanently embedded with the video download. When you purchase The Missing Link you are paying for two items. First is The Missing Link Ring. Second is the performance license. The Missing Link Ring and License are a single product. The video training download are complimentary and free to each purchaser of The Missing Link License and Ring. It's is yours to use and perform until the guidelines below. If you ever decide to sell The Missing Link please understand that you are selling both the Missing Link Ring and License. After sale you no longer have the right to perform The Missing Link routine. In your package you will receive a document that you must keep to insure you have legal performance rights. This document must be transferred to the new owner upon sale. We will respond ASAP but please be advised that sales on the internet are instantaneous. It is possible we will advise you The Missing Link is in stock but in fact stock is sold out before your purchase. We are not responsible for any backorder situation.